Gaming desk chairs are specifically designed for PC gamers who need extra ergonomic support for extended sessions in front of their gaming rigs (Source). The BestOffice and Langria gaming desk chairs both include extending foot rests for full prone resting positions if you want to take a nap. The BestOffice also is the highest-backed chair, rising 36.6" high from the seat surface (Source). The Homall ﻿racing desk chair has the highest weight capacity at 280 lbs, while the other options hover around the 260 lb capacity level. Generally, the more customizable the chair is, the better your sitting experience will be. The 5 chairs we selected are relatively inexpensive options that provide solid value, but if you're looking for a truly high-end gaming chair the Steelcase Leap Fabric Chair is the top luxury option suggested by PC Gamer (Source). The Homall gaming desk chair is made from PU Leather (the 'PU' refers to a split leather backing that is layered with polyurethane). Features a 360 degree swivel, with multi-direction wheels designed to smoothly strafe across floors. The chair does rock back and forth, unlike some chairs that are uncomfortably fixed. It has a 280 lb maximum weight capacity, with a 20" X 20" seating area dimension. ​Buyers say that this 'value' chair is great for extended gaming and work sessions- it keeps perspiration down to a minimum and doesn't produce physical soreness. It takes about 20 minutes to assemble. Some buyers wish that the arm rests were adjustable and that the armrest padding were a little bit thicker. It is a sleek and attractive-looking chair, at a budget price. Remember- if you want an ultra-luxury chair with all the ergonomic bells and whistles, check out the Steelcase Leap Fabric Chair. Height adjustability: A typical functionality for pretty much all executive gaming chairs. Armrest height adjustability Much less common. A smart idea as set height armrests can lead to physical discomfort. Tension control. Letting you restrict or ease the tension degree in the backrest. This impacts how much push you have to use to lean back. Backrest lock. Occasionally gaming chairs will even permit you to secure the backrest in position as well as managing tension. Seat pan slider. This allows you to slip the seat of one's chair forwards or backwards with regards to the backrest. This gaming desk chair offered by Homall is a solid option for someone who needs a high-back office chair. Users like the coziness and functionality of this gaming chair, but some do complain about cheap quality. This product features 360-degree swivels and multi-direction wheels that move smoothly on a floor. It comes in 4 colors: blue, blue/black, red and red/black. 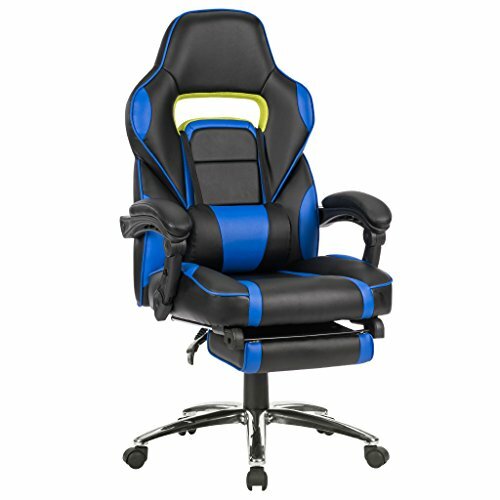 This racing style task chair seems like a solid choice if you are looking for a computer chair with good lumbar support. The general user consensus concerning the Homall gaming desk chair is that it is comfortable and well built. One happy purchaser states that it gives good lumbar support and that it is easy to assemble. However, some buyers complain stating that the quality is poor and that the chair starts to fall apart soon. One dissatisfied buyer complains that the chair barely reclines and that it is not that comfortable for long term gaming. This gaming desk chair offered by Merax is a solid option if you are looking for a high-back ergonomic leather office chair. Users like that this gaming chair can be transformed into a sleeping chair, but do complain about certain quality issues. This product features a 360-degree swivel rotation,armrest angle and seat height adjustment, as well as a recline function. It has an ergonomic design which provides comfort for those who work at desks for long periods. It is available in 4 colors: blue, red, yellow and purple. This PU leather desk chair might be a solid choice if you are looking for an office chair with a tilt mechanism to relax and lean back. In general, users have a favorable opinion of the Merax gaming chair, saying that it is comfortable and that it has very good back support. One user shares that the seat and back are firm enough to support but soft enough for exquisite comfort. He adds that the assembly was quick and easy. Another thing purchasers love is that the chair can lean all the way back so you can sleep in it. However, some buyers complain about the chair not being sturdy enough and having very weak arms. One dissatisfied user states that the fasteners are recessed and covered with plastic caps which tend to fall out easily. Another one shares that he ran into an issue with piston losing pressure and dropping chair from maximum height every few days when sitting down on it. If you are looking for a top-rated high-back computer chair, you might want to consider this ergonomic design racing chair offered by Best Office. Users love the comfortableness and usefulness of this gaming chair, but do complain about the lack of any adjustment of the armrests. This product features a360-degree swivel and it allows for a 90 to 180-degree backward movement, which is great because you can lie down like in a bed. It has a tubular steel frame and a metal star base, as well as comfortable armrests. It comes in two colors (black-white and black-blue). If you are looking fora comfortable high-back gaming chair, this might be a good option. In general, users have a favorable opinion of this gaming desk chair and they state that it is very good for the price, heavy duty, comfortable and easy to assemble. However, purchasers complain about the armrests which can’t be adjusted. Some users also complain about the noise that the chair makes if you move, which makes it hard to game in it at night. 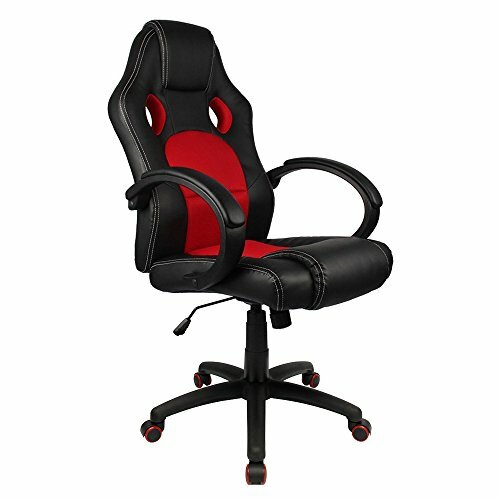 This office computer chair offered by LANGRIA is a good option for those who need a high-back racing style faux leather gaming chair. Users like the sturdiness and coziness of this chair, but some do complain about the leg rest and the seat which doesn’t recline. This product features a high-back design with well-padded headrest, backrest, seat and armrests, which makes it perfect for home, office or college dorms.The chair has a footrest which can be pulled out and flipped over as a recliner for office napping. It comes in two colors: black-red and black-blue. This gaming desk chair could be a solid choice if you want a sturdy one that can support up to 265lbs of evenly distributed weight. In general, buyers say that this is a strong chair, sturdy, comfortable and easy to put together. One online reviewer shares that it is a durable chair made of high-quality materials with a thick lumbar support. However, some buyers complain about the leg rest saying that it seems a little flimsy and unstable for a large guy. One dissatisfied purchaser warns that the seat doesn’t recline, causing whomever is sitting in the chair to slide down. If you are looking for a gaming desk chair, you might want to consider this race car style bucket seat office chair offered by Giantex. Users like the comfortableness of this office chair, but do complain about the quality and because it lays back too far. This product features a “bucket seat”. It has a comfortable back that molds around and supports your back. It comes in 6 colors: black, blue, grey, green, orange and red. If you are looking fora gaming desk chair with weight capacity of 264 lbs with a bucket seat, this might be a solid option. In general, users have a favorable opinion of this Giantex gaming desk chair, saying that it is comfortable, giving good back support and that the leather feels great. However, some buyers complain about the chair being cheaply made and not sturdy at all. One online commenter says that the chair lays back pretty far and you can fall backwards if not careful.Another one shares that it started to make really loud snapping noises soon after the purchase. The first swiveling leather gaming desk chair we examined is manufactured by Homall. You can buy it in blue and red configurations. It features 360° swiveling wheels designed for multi-directional gliding over residential services. It can also rocking back-and-forth, which many PC gamers appreciate- keeping them loose and limber while playing Modern Warfare. It will accommodate up to 280 pound gamers and ships with a lifetime replacement warranty. You can actually purchase assembly at check out, but buyers said it's not too difficult to put together- all you need is the included hex wrench. The arms do have a set height, so you can't adjust them up and down. Some important measurements to consider is that the backrest is 27 inches long and 3 inches thick. One gamer we spoke with had been in the market for a gaming computer desk chair that would be comfortable and attractive and help keep his back and buttocks from getting sore during extended sessions of World of Warcraft. After having used it for several months, he says it provides decent lumbar support, though he thinks it should be adjustable. Another reviewer who previously had a plush office chair that his cats enjoyed scratching up, says that this is been a good option for him because the fabric isn't attractive to his destructive felines, though if you want a chair that has some plush cushiness this isn't the best selection for you. Another e-Sports gamer endorsed it as a well- after buying this racecar style gaming chair and over several weeks of use he's worn it into a comfortable groove that suits his oversized stature. The second ergonomic gaming desk chair we examined is the Merax ergonomic swivel chair. It's advertised towards gamers who spend several hours at a time in front of their PC monitors- providing pneumatic height adjustability to comfortably position you during marathon gaming sessions. A solid executive desk chair, it's been loaded up with some handy ergonomic features including a lumbar support system, tilting mechanisms for relaxing lean backs, tilt locks, and a proprietary ergonomic butterfly seat plate. One buyer who suffers from painful vertebrae stenosis tells us he had been in the market for an ergonomic gaming desk chair that would provide him comfortable and cushioned back support so that he could enjoy playing first-person-shooter PC games. He tells us that the back support is cushioned and contoured in such a way to provide supportive, near medical-grade cushioning for his injured lower back. Another reviewer says that the chair leans back so far, nearly into a vertical position, that he has been tempted some nights to actually sleep in it. Additionally, buyers commend the armrest cushioning- saying it has sufficient padding, though there are some supplementary arm cushions you can buy as aftermarket modifications. 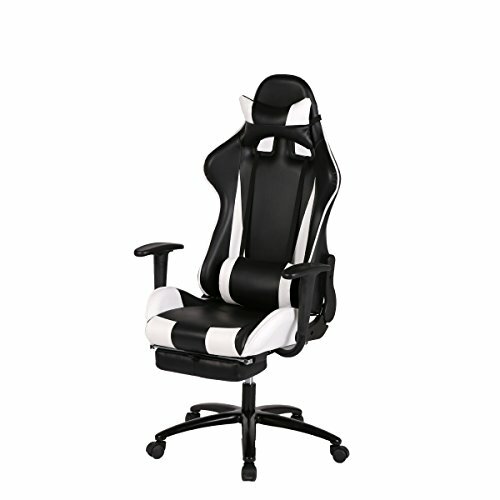 The third high-backed computer gaming chair we examined is manufactured by BestOffice. It features a maximum weight capacity of 250 pounds with a seated height between 17.5 inches and 20.5 inches. It's marketed as a deep-bucket gaming desk chair that sets itself apart from traditional office chairs by its ergonomic lower-back support, with the added ability to recline 180° backward so you can lie down on it like a bed. The way this works, there is an extendable footrest you can use to lie prone on. Buyers tell us that the lumbar pillow adjusts up and down, while the neck pillow itself cannot be moved that much. Buyers say that over time expect the chair to develop some squeaks- you can remedy this with some careful lubrication using WD-40. While the armrests can't be adjusted, buyers were impressed by how functional the foot rest was- though it can be a little bit tricky tucking it in and out without eventually squashing or pinching your finger. 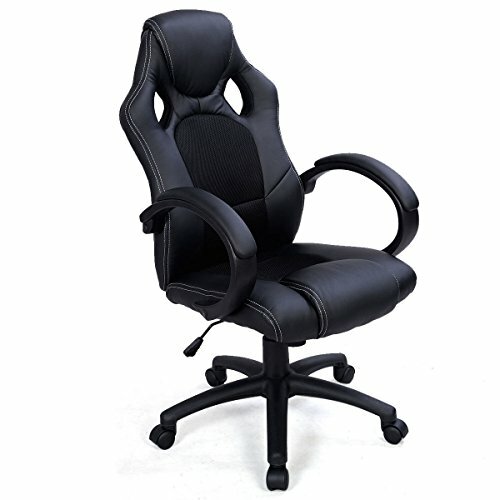 The fourth high-backed gaming desk chair we examined is manufactured by Langria. Like other options we have examined, it's advertised towards people who spend a great deal of time in front of the computer- particularly competitive online gamers. It features all of the standard options including a back tilting mechanism, 360° swivel, but unlike the last option we examined the armrests have angle adjustments. As well, since it features a foot rest it allows users to stretch out their legs, which is a comfort feature that some people find essential, while others don't really use it that often. Reviewers said this was an inexpensive alternative to higher priced, brand-name racing gaming chairs that was relatively easy to assemble and comfortable to use. While buyers say that the armrests aren't particularly adjustable, the backrest can move up or down to accommodate people of different stature or different comfort preferences for their lumbar region. One buyer who stands over 6 feet tall and over 230 pounds says that this is a massive chair that has turned out to be a stylish, sturdy and comfortable option for his living room. He does say however that because of his large size and weighty legs that the leg rest probably will not stand up over time- but this isn't a big deal for him because he doesn't plan on sleeping on it. The last gaming bucket seat office chair we examined is manufactured by Giantex and comes in black, blue, gray, green, orange and red colors. It has a 264 pound weight capacity and features a bucket seat designed to support office workers laboring at their day jobs and gaming enthusiasts playing Street Fighter on their Alienware gaming rigs. You'll need to assemble it with an Allen wrench and some buyers complain that there were issues of overlap between the backrest connector and the foundation of the pneumatic connector. For taller gamers, buyers say this wasn't an ideal option- with one reviewer who stands a little bit over 6 feet tall finding out that his head completely cleared the head rest with the result being an uncomfortable experience for his shoulder blades. Some other buyers had difficulty aligning the screws between the backrest and seat- they didn't line up, causing buyers to have to force them in. While some were impressed by its attractiveness, there have been complaints of its long-term structural viability- with some complaining that it began to become tilted to one side, and that the seating was uncomfortable from the get go- so for this reason not a recommended purchase from us. If you splurged on an expensive computer with 12 gigs of RAM and a GeForce video card, you may be less inclined to break out your wallet to purchase a high-end gaming desk chair- but we would suggest that you not be too stingy when it comes to making this purchase. A quality chair will last for a very long time and save you painful back aggravation down the line- so you won't end up having to visit a chiropractor or a yoga studio in your old age. Indeed, competitive gamers need a throne if they are truly dedicated to their craft and the options we have examined here are less expensive than some of the higher end options you'll see on the market. There are some other styles as well to consider- and you can purchase a beanbag style gaming chair, a rocking chair that sits on the floor and a pedestal-style gaming desk chair and even custom-made options that are great for flight simulations. Looking at some medical research, there are a plethora of studies out there that demonstrate how harmful long-term sitting can be- particularly aggravating the wrist, the neck, shoulder, lower back and tightening your hamstrings. 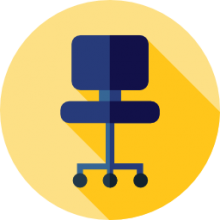 While all these chairs won't necessarily provide a comprehensive solution, it's still better to purchase something ergonomic and designed to at least minimize the negative health effects of long-term sitting. The best advice out there is that you'll want to move around every so often- this means that if you are prone to sitting and staring glued to your seat for several hours at a time you want to break that up with movement around your home or office on rest breaks. Overall, you'll want to purchase a chair that features height control, armrest control, tension control, a backrest the lock as well as a seat pan slider. Chairs with all of these different features enable you a greater customization so that you can adapt it to your particular body requirements.